In cooperation with Onyx Path Publishing, we’re proud to announce the upcoming Scarred Lands Player’s Guide, the rebirth of the great fantasy roleplaying game setting created at White Wolf for 3e OGL. Stewart Wieck of Nocturnal Media and Richard Thomas of Onyx Path were both among the primary architects of the Scarred Lands in its first incarnation, and now in this joint venture we seek to fund its return with a project on Kickstarter. The bestselling French roleplaying game Würm is concluding a project on Kickstarter to fund an English-langauge edition. Würm is a system-lite RPG with an indie aesthetic that sets in the last period of the Ice Age. In this long-forgotten time, many powerful creatures roamed over a vast territory covered in steppes and taiga, reaching from the white mountains to the raging sea: mammoths, aurochs, bison, giant deer, cave bears and cave lions. We’re proud to present the return of the classic fantasy world Talislanta in a new Kickstarter project. Set in an era prior to the original Talislanta RPG, this new vision of the world premieres in a webcomic/graphic novel called Talislanta: Tales of the Savage Land. Our successful Kickstarter project for Jim Trunzo’s Gladiator: Quest for the Rudis has moved to the next step of production. The proof samples we received from Hong Kong have us even more excited about this massive game. Nocturnal Media today introduced Talislanta: The Savage Land (TSL), a new vision for the classic Talislanta Roleplaying Game. The first version of the Talislanta RPG debuted in 1986. It was known for its non-traditional fantasy setting, which featured hundreds of unusual races, creatures, and archetypes, and for a series of ads that ran under the headline, “No Elves”. Almost 25 years since it was first released in Spain, Aquelarre ("Coven") may finally receive an English translation. Aquelarre is available from Spanish publisher Nosolorol in a gorgeous 500-page full-color hardcover edition that we hope fund in English with this Kickstarter project. Like making a deal with a devil, Aquelarre is not for the faint of heart. It's not an introductory RPG for younger players. The realistic historical setting is dark. Some of the artwork is disturbing. 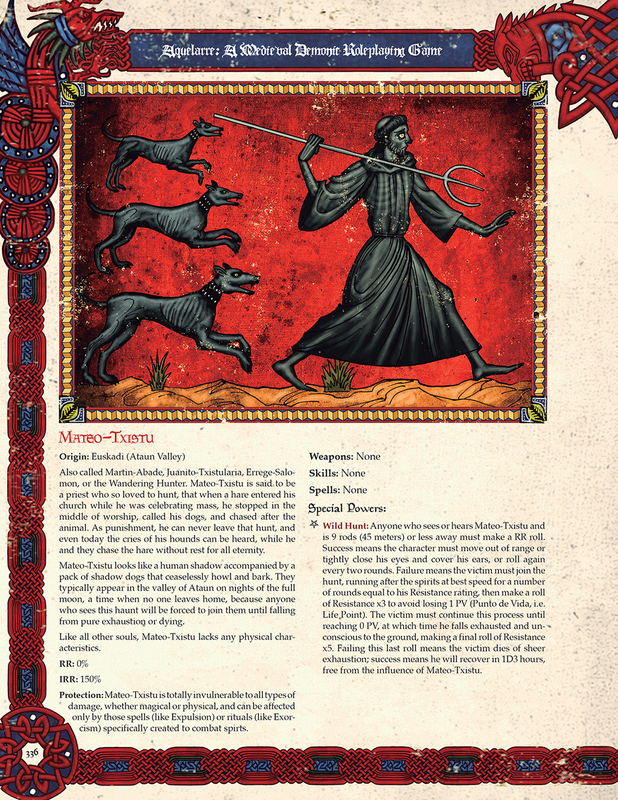 Nosolorol describes this new edition of the game as "more medieval and more demonic than ever" and they are correct on both counts.